Following a death, St Barnabas offer Bereavement Support. Takes referrals from everyone. You can ask for help yourself, your family or friends may ask us to support you or you might be referred by health and social care professionals. Individual support lets you talk confidentially, either over the telephone or face to face. A trained counsellor will help you explore your feelings, develop coping strategies and adapt to your changing circumstances. Group support is facilitated by trained volunteers and meetings are held across Lincolnshire. They are a safe, comfortable and friendly place where you can express your feelings and emotions. Our team will help you deal with overwhelming feelings, they are there to listen. 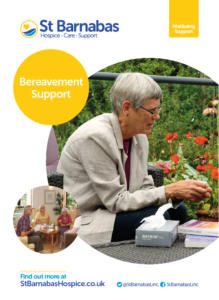 The groups allow you to meet other bereaved people, and provide friendship and support. Can I access a bereavement group? For more information about the drop-in groups, call 01522 518 246. You can self-refer to the Family Support Service by contacting 0300 020 0694, or a referral can be made on your behalf by a family member carer friend or other care professional. They will need to have your permission to do this. If you would like further information about the services we provide please call a member of our team on 01522 518 225 or email family.support@stbarnabashospice.co.uk. To download our patient information our Bereavement Support service simply click the image below or here.